The last third of my challenge has just begun. I am in Mainz right now, a small city close to Frankfurt. It’s day 53 and I have already made 1623 kilometers. So I have about 850 kilometers left for the last 27 days. That will be tough! Anyway, I have just been to a so-called humor museum. In my opinion humor and museums don’t really have much in common. But this is Germany! Michael Berger owns the museum and showed me different rooms where everything is upside down or rooms with funny plastic ears stuck to the walls. The museum is interesting but I am a little puzzled. Is it maybe because we Germans are known for not being that funny? A new survey says that Germans are considered to be the least funny people on earth. Michael says that gloating is much common in Germany than self-irony. So I did the test: I put a banana on the side walk and slipped on it three times: Two pedestrians laughed, one was worried. Ok, we are more into gloating. Then came test number two. 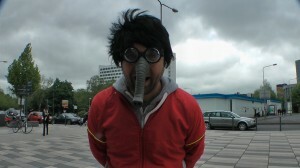 I provided pedestrians with funny glasses and a carrot nose to wear. They had to look at themselves in my camera viewfinder. Two people laughed, only one stayed serious. Yes, you can also find self-irony in Germany. I am glad!